Jon de Quidt and I recently looked a bit into the data from the paper of De Mel, Woodruff and McKenzie (2008) in Sri Lanka. 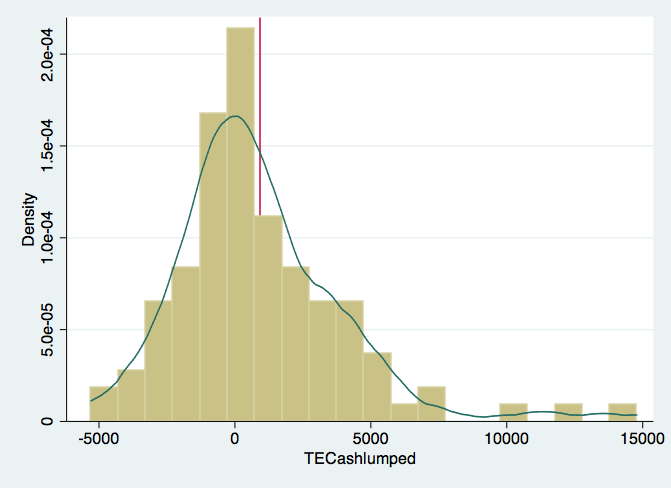 It is quite an influential paper, experimentally administering capital shocks to microenterprises in Sri Lanka in order to estimate the returns to capital. Their paper highlighted that the returns to capital “at the bottom of the Pyramid” could be very large indeed. In their favorite specification they find that these could be as high as 50 – 63 % per year (in real terms). This suggests that these investments pay-off on average. It was one of the first papers that used experimentally generated variation in capital stocks to estimate these returns. Thats why it became so influential and the authors have a set of papers on Mexico and Ghana, performing similar estimates. They point out that there is a lot of heterogeneity in the estimated treatment effects. In particular, they observe that for female entrepreneurs, there is virtually no (average) treatment effect. This and the reasons that could be underlying this observation are explored in a second paper. We had a look at the De Mel et al (2008) data, which is available here. We essentially ran their regressions of (reported) real profits on the treatment dummy. However, we did this iteratively for each individual treated person, using the whole group of non-treated individuals as counterfactual. This allow us to get an estimate of the treatment effect for each individual treated. From this, we get a distribution of treatment effect estimates. The average of this should be the treatment effect that De Mel et al (2008) report in their paper. And indeed it comes quite close. However, what we are intrigued by is the significant heterogeneity in the point estimates for the treatment effect for different individuals. A key observation is that the treatment effects are very heterogeneous – the mass of enterprises who saw a drop in profits is almost as large as the mass of enterprises that saw a rise, however, some saw a very significant and large rise in real profits. The vertical line is the average of the treatment effect, which here, as we lumped the cash treatments together, is around 900 rupees. The median treatment effect however, is only 332 rupees. Thats some food for thought.